What could the west learn from Japan? Boxing is one of the most international of sports. Whether you fight in Tokyo or Texas the sport is the same with two fighters and a referee in a ring with the fighters trying to win the majority of the rounds or score a knockout to win. At it's core it's a very simple sport to understand. Sadly whilst it's simple to follow in the ring the out of the ring part of the sport seems to be a mess all too often with little being done to stop mismatches and next to nothing being done to stop fighters padding out their records for years. At the moment there are fighters around various parts of the globe with records that fail to suggest how talented, or limited, they are. For example after 31 fights we have no idea how good Deontay Wilder is, or after 17 fights how good Chris Eubank Jr is. Lets be honest when a fighter in Japan gets to 17 fights we tend to have some sort of an idea as to how good, or bad, he is. So what exactly can the west learn from Japan to stop massive record padding, mismatches and and even improve the quality of it's fights and fighters. Every fighter who turns professional in Japan needs to earn a license. This done with a 2-part test. Part of that test is a written test to prove they know the rules and understand the sport, like any fighter should. The other part is a practical test where a fighter takes part in a public sparring bout with headgear on. This is to prove that they can box and they can take the skills into the ring. It might seem like a lot to get a license but it also allows the Japanese Boxing Commission (JBC) to "grade" fighters. A normal guy who wants to take up the sport would, if they past the tests, usually earn a C grade ranking, that of a novice with out much in terms of an amateur background. A C grade license allows a fighter to fight in 4 round bouts against other C grade fighters. This keeps the fighters on a similar level to each other so we can't have mismatches between two domestic fighters. After you've proven yourself you can obviously move up through the license system to claim an A license and be eligible for title fights and any bouts of the 8 round distance. If you're good enough you can progress very quickly, as we've seen from Kosei Tanaka for example who looks set to fight for a title in his 4th professional contest. Not only do the JBC enforce their licensing to get fighters to prove their ability but they also have a domestic rule where by a Japanese licensed fighter cannot fight, in Japan, for a world title before winning either the Japanese title or the Oriental (OPBF) title. This perhaps an odd rule in the eyes of some but it does make sense. If you can't prove your the best in the country or the regional area why do you think you're the best in the world? There are ways around this however and if you're willing to fight for a world title outside of the jurisdiction of the JBC you are welcome to fight for a world title. We've seen Tomoki Kameda do this, winning his WBO title in the Philippines, and Atsushi Kakutani did it when he came up short in Mexico against Adrian Hernandez. It seems that for the JBC the idea to step up through the levels and this also legitimises the OPBF and Japanese titles which, in recent years, have had almost every Japanese world champion holding one, if not both, of them. As well as ruling on domestic fighters they also have rules about imported fighters fighting on shows that they sanction. Unlike almost any other country they want to have a high level of competition and if an important gives a "lethargic effort" they are banned from fighting in the country. It might seem harsh at times but it's something that certainly helps make visitors give their all. As a result Japanese fans get international journeymen like Marjohn Yap who come to win as opposed to just making up the numbers. It's actually in the visitors best interest to give a good effort rather than turn up for the pay day, after all if they get invited back due to being a good test they get paid solidly again. With many journeyman coming from places like Indonesia, the Philippines and Thailand the purses they get for fighting in Japan are very handsome when compared to what they would get fighting a domestic level contest. Unlike Britain and the US a journeyman winning in Japan doesn't suggest the journeyman did their job wrong, in fact it means the man they beat usually isn't as good as they think and the journeyman can act as a measuring stick. This way to minimise mismatches would see fewer fighters coming just to lose, especially in the UK where the purse for a journeyman fighting in the UK dwarfs what a fighter would get in Latvia or Hungary for example. As well as the "lethargic effort" ban the JBC do also ban for failing to meet a contracted weight, a lack of skills and in some very rare cases things like "full body tattoo", "name spoofing" and being "immature". It's also worth noting that it's not just journeymen who have been banned but also so pretty big names like Sonny Boy Jaro, pictured, and Liborio Solis, who were both given a year long ban for coming in over-weight. For those interested a full list of banned fighters can be found here, in English. Fights being on free to air TV isn't a rule of the JBC but it has helped keeping boxing a relevant sport in Japan. It helped fighters like Shinsuke Yamanaka and Koki Kameda become household names and it has helped the sport remain in the spot light. Interestingly it has also been a success with the likes of TBS, Tokyo TV, NTV and Fuji TV all showing free-to-air boxing. Not only that but they also have some lesser cards on pay TV to help televise more fighters and help those fighters develop an audience before going on to free TV. In many ways this is the opposite of how it works in the US. In the US a fighter often transitions from subscription TV, for example ESPN, to PPV and in the end their audience shrinks whilst their purses grow. It helps the fighters bank account in the US and that's obviously their aim in the sport but it takes away from the people and helps to really minimise the audience. In Japan Sky A Sports often get the rights to lesser bouts whilst Fuji TV's paid sister channels show regular fights as part of their "Diamond Glove" series which often feature OPBF or Japanese title fights. When it comes to world title fights the fighters generally progress from the pay TV circuit to the free TV market. Notably their have been exceptions to this trend but it's a general trend. In Japan if a prospect is touted highly they tend to want to live up to that hype quickly. 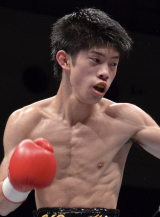 Ryota Murata for example is expected to fight for a world title within 15 fights, and fought an OPBF champion on debut, Naoya Inoue won a world title in his 6th fight and Kosei Tanaka called out the Asian champion after his third fight. In the west so many fighters are happy to pad their record whilst developing slowly, or even stagnating, due to a poor level of competition. Going back to Chris Eubank Jr, for example, his 17th fight came against someone who had been stopped by one of his previous victims. The bout made little sense other than to get Eubank a quick victory when he would have been served much better to have fought a British fighter such as Adam Etches, Nick Blackwell, John Ryder or Danny Butler. Of course if Eubank Jr fought one of those 4 aforementioned domestic rivals his risk of losing would have been higher but his development, win or lose, would have been much more important and, if he won, he'd have proven himself ready to challenge for the national title. Instead by beating a very poor important he proved nothing. In Japan and in the Philippines the commissions publish domestic rankings every month. This allows fighters to see how close they are to earning a national title fight and also helps them see who is above them. For fans however things are even more telling as we can see what level of competition fighters are really fighting at. For example if the #10 and #9 fight each other then the winner is surely deserving of consideration of the next opportunity in their weight. By Publishing rankings the JBC and GAB show real transparency and we, as fans, can follow the moves month after month. We can criticise the changes that don't make sense, we can see who is deserving of a title fight and we can see who doesn't belong in a title fight. It seems very odd that the BBBofC don't publish these and adds to the feeling that British Board are secretive. It's a shame that the sport isn't more transparent but of course the more transparent it is the more the boards, commissions and authorities leave themselves open for criticism, something they tend not to like. As well as the 6 issues outlined above there are numerous others that some other countries should perhaps take note of, such as the importance of a "home" for boxing like the Korakuen Hall, or even the Gym system. Though they would both take a lot of change to be implemented, and we'd never expect such a drastic set of changes to be made, they really would help the sport in some countries, especially those were promotional cold wars are threatening the sport.